Powers/Abilities: Atom Smasher could generate and project large amounts of nuclear radiation in the forms of concussive force, heat, or hard radiation. He may have had some degree of superhuman durability, as he took a series of punches from Giant-Man without being knocked out (though Giant-Man was weakened from radiation poisoning at the time). It is not 100% certain whether his power came from his costume, or whether he had been mutated by the nucleonic radiator; I would think the latter. Atom Smasher once commented that the Neutralode would be powered by the atomic energy of his own body. He was also presumably a genius in nuclear physics, robotics, etc., unless he commissioned someone else to design his technology, such as his Gyrojet, Neutralode, and Robotrons. He also led a group of agents. (Marvel Fanfare I#3/2 (fb) - BTS/ Marvel Two-In-One#85 (fb) - BTS) - Working with his brother Michael, Ronald English designed a prototype Nucleonic Radiator while employed by Cross Technological Enterprises (CTE). When Ronald refused to let CTE cheat him out of the patent rights to the Radiator, his supervisor, Connors has him fired. English took his plans with him and built a new device which he used to become the super-villain Atom-Smasher. (Marvel Two-In-One#85 (fb) - BTS / Marvel Fanfare I#3/2 (fb) - BTS) - Michael English claimed credit for the death of his brother, Ronald/Atom-Smasher, stating that he had been too weak to exploit his power to its fullest potential, though Ronald had been assassinated by Warhawk under orders of Mr. Connors (see comments). (Marvel Encyclopedia Vol. 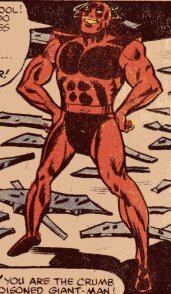 6: Fantastic Four: Atom-Smasher entry) - After the death of his brother, Ronald, Michael usurped his nucleonic radiator, mutated himself, designed a duplicate costume, and became Atom Smasher. (Marvel Two-In-One#85 (fb) - BTS) - Gathering a small army of underlings (possibly recruiting Ronald's former agents), Atom Smasher made plans to build the Neutralode. He planned to use the Neutralode to devastate and then loot an entire city, after which he expected to pressure other nations to pay him to prevent similar assaults. He and his agents began looting of a number of companies. Jessica Drew was hired by an unspecified insurance company to investigate the rash of industrial robberies. (Marvel Two-In-One#85) - Atom Smasher watched from the shadows as his legions robbed an unspecified factory in San Francisco. When Spider-Woman (Jessica Drew) assaulted the criminals, Atom-Smasher downed her with a single blast, ordered his men to complete the theft, and then departed with them in his gyrojet. Atom Smasher and his men robbed Stark International (formerly Stark West)'s Los Angeles facility, attracting the attention of the Thing, who was there with his friend Bill Foster (who was suffering from radiation poisoning from past battles as Black Goliath with Ronald English). The Thing easily took out the agents, but then Atom Smasher blasted him through the wall, allowing he and his men to escape with the final components for the Neutralode. Shortly after Atom Smasher completed the Neutralode, the Thing, Spider-Woman, and Bill Foster broke into his facility. 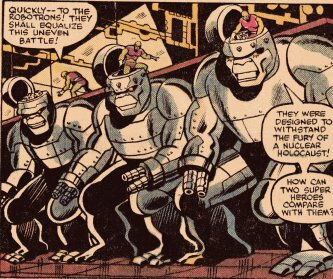 Three of Atom Smasher's agents entered and operated the Robotrons in an effort to equalize the uneven battle, but the Thing swiftly demolished all three of them. Atom-Smasher stunned Spider-Woman with a second blast and rushed to activate the Neutralode, and Foster risked his life, returning to giant size and pummeling Atom Smasher, knocking him back into his own weapon. Despite Foster's determined efforts, his weakened form couldn't stop Atom Smasher who channeled his power into the Neutralode; however, damaged by Atom Smasher's previous collision, the Neutralode instead overloaded. Unwilling to give up with all that he had sacrificed to get to this point, Atom Smasher continued to pour power into the Neutralode, which exploded, apparently killing him. Foster felt that his last chance to cure his radiation poisoning had died with Atom Smasher, but Spider-Woman's immunity power saved his life; but as her power had been severely taxed by Atom Smasher's attacks, she forfeited her own immunity power in doing so. Comments: Created by Tom DeFalco, Ron Wilson, and Chic Stone. How do you explain Atom-Smasher's brother taking the credit? Well, either he was used as a third party by Connors to hire Warhawk without being directly connected, or maybe he just hated his brother enough to claim the credit anyway. 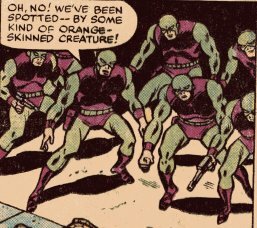 Atom-Smasher's underlings seem like the sort of paid thugs that Taskmaster might have trained. Marvel Two-In-One#85 was my first MTIO issue, and it's still my favorite. Atom Smasher has a full entry in the All-New OHotMU Update#4. Atom Smasher, the anti-nuclear terrorist, @ Iron Man I#287. Atom Smasher used them to commit thefts, transport (and presumably assemble) equipment, and fight opponents. It is uncertain whether these agents were the same as those used by his brother, though those agents wore differently colored costumes than this group. Some of them carried ray-guns, and at least three of them had the know-how to operated the Robotrons. It would seem likely that their costumes provided some degree of protection from radiation. At least seven were seen at once. A small ship of unknown origin, it flew Atom Smasher, several of his men, and whatever equipment they had stolen from city to city. Powered by the atomic energy of Atom Smasher's own body, it was to release a flood of deadly neutron rays into a nearby city, killing millions and allowing his men to loot to their heart's content, after which he thought other nations would pay billions to prevent such a tragedy from occurring again. 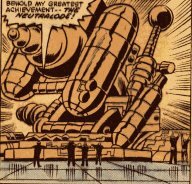 Atom Smasher built the Neutralode with parts stolen from a number of companies, but it was damaged in battle with Giant-Man, and it overloaded and exploded when Atom Smasher attempted to use it, apparently killing him. Perhaps 20 feet tall, these giant robots were operated by an agent from within their head. They were superhumanly strong (lifting about 10-20 tons via hydraulics) and durable, though they were no match for the Thing. They could also fire blasts from their head cannons that could blast through 20" thick titanium steel plates. They could also fire laser blasts from their wrist weapons. Marvel Two-In-One#85 (March, 1982) - by Tom DeFalco, Ron Wilson, and Chic Stone.